If you’re brushing and flossing daily, as well as seeing your dentist at least every six months, you’re doing the top things needed to maintain your dental health. But all your hygiene efforts could be undermined if you’re not eating a dental-friendly diet. 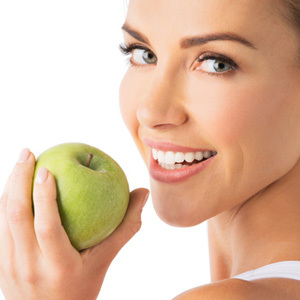 Simply put, there are foods that protect and promote dental health and those that increase your risk of dental disease. Diets in the latter category are typically high in added sugar and low in natural food fiber. The largest sources of these are processed sugars from sugar cane or beets and high fructose corn syrup. With just a little knowledgeable label reading, you can find sugar and its various aliases added to thousands of processed food items including pastries, candies, sodas and energy drinks. Heavy consumption of processed sugars also contributes to dental disease. Disease-causing bacteria thrive on sugar as a food source, which fuels both their growth and their production of oral acid. Elevated acid levels can dissolve the minerals in tooth enamel faster than saliva can keep up. Softened enamel opens the door to tooth decay, while increased bacterial growth can lead to periodontal (gum) disease. A diet, however, low in added sugar and high in fiber can have the opposite effect. Although fresh fruits and vegetables contain natural sugars, they also have indigestible parts called fiber that slow the digestion of any sugars and allow the body to more efficiently process them. With the higher quantity of vitamins and minerals found in unprocessed foods, the overall effect of this diet is a decrease in your risk for dental disease. Speaking of dental-friendly foods, we should also give honorable mentions to certain dairy items like cheese and milk that stimulate saliva production and are rich in calcium needed for tooth strength. Another beneficial category is both black and green tea, which contain antioxidants to fight disease and fluoride to strengthen enamel. Adopting a low-sugar/high-fiber diet can have a profound impact on your overall health. Over time, you’ll also reap dental health rewards with stronger teeth and gums and a lower risk of tooth decay and gum disease.